The Healthy Lawyers team recently attended the Natural Food Expo West in Anaheim, California on March 6-9, 2014 where the exhibit halls contained over 2,500 manufacturers of great tasting natural foods. We tasted hundreds of 100% plant-based, organic and non-GMO foods, snacks and beverages and below are the products that scored big and have made the Healthy Lawyers Smart Food recommendation list. We at Healthy Lawyers will only recommend products that taste good and are the best for your health, which is why we call them "Smart Food". If you would like to host a Smart Food Fest at your law firm, legal department or office, let us know and we will get samples of these products for you to taste. Click the images below to learn more. 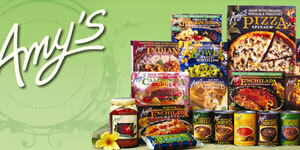 Amy’s fine pre-made meals are made from the best organic ingredients and prepared like a home cooked meal to insure you receive the best tasting health food for mind and body. 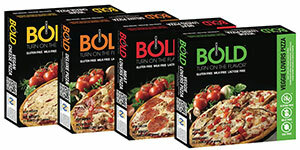 Bold makes a melt in your mouth non-dairy, organic and gluten free pizza that will convert any pizza lover to a all plant-based pizza. What's so great is that the pizza's can be baked directly on the top rack of a toaster oven right in your office. Try these great tasting certified gluten-free, vegan, and kosher pareve cookies that will nock your socks off. Beyond Meat is a cutting edge developer of new plant protein products aimed at replacing animal protein while providing nutritional value at a lower cost. It looks like chicken, feels like chicken and tastes like chicken but goes "beyond" chicken as it does not contain the cholesterol, fat and the "cluck" of chicken. 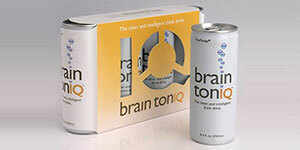 True Toniqs has developed the "clean and intelligent think drink" for all who have busy lives that require peak mental performance at all times. Best yet, this drink has no caffein. Earth Balance - GFA Brands, Inc.
GFA Brands produces a remarkable line of 100% plant-based, vegan, non-GMO, lactose free, gluten free, egg free, casein free buttery spreads, shortenings, nut butters, dressings and milks all of which have 0g of trans fat. 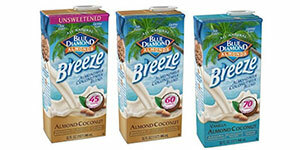 Blue Diamond Growers has over 100 years of experience in producting the bests almonds, almond drinks and snacks that research reveals can help to reduce cholesterol levels and may protect against cancer. Organic Crunchies are patented freeze dried fruit and vegetable snakes that taste great, heart healthy, gluten-free, vegan and NON-GMO snacks. Follow Your Heart has been a leader in vegan sandwhich spreads and now they have launched a great tasting non-dairy cheeses that have a real chease taste, that melts and has great texture! It's also NON-GMO, vegan, gluten free and soy free.